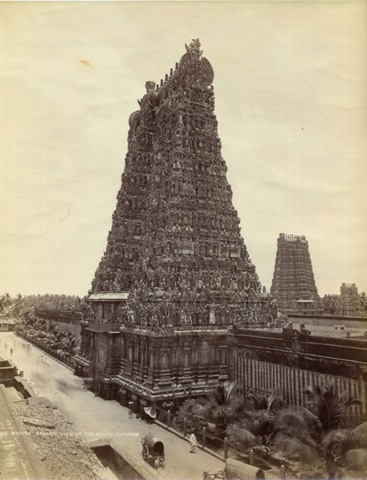 Alighting at Tiruvannamalai station on the morning of 1st September, 1896, Venkataraman beheld his promised land in the starry-pointing towers of Arunachaleswara’s Temple from afar. 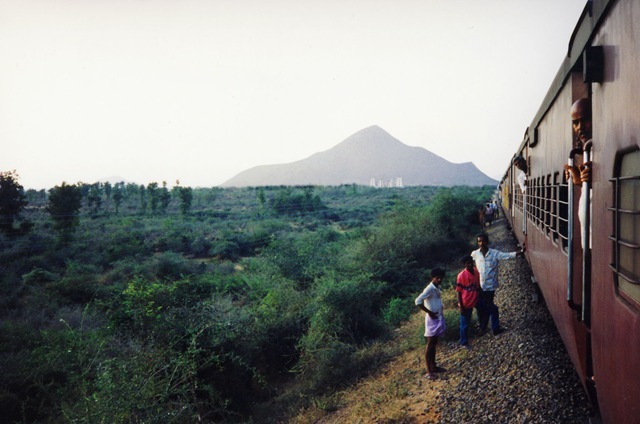 Arunachala and the Temple towers coming into view from the train. As with the Saint Nanda, the very sight of the towers filled his soul with joy, arising not merely from the sense of achievement but also from the close proximity to Bliss itself. With quick steps and a bounding heart he proceeded straight to the great Temple. 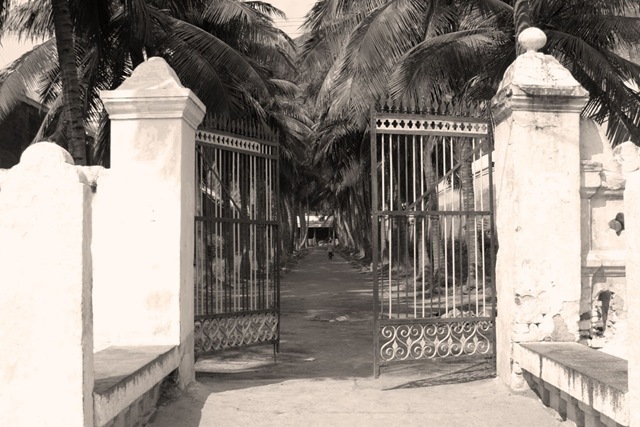 The gates of the three high compound walls and all the inner doors were open. The above excerpts appear in “Self-Realization, Life and Teachings of Sri Ramana Maharshi,” by B.V. Narasimha Swami, published by Sri Ramanasramam, and the accompanying quote is by Bhagavan Ramana. 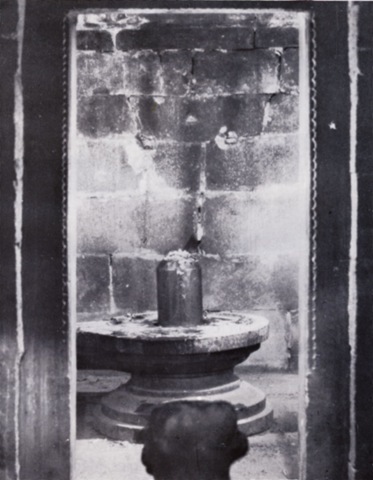 Old image from outside Pathala lingam. 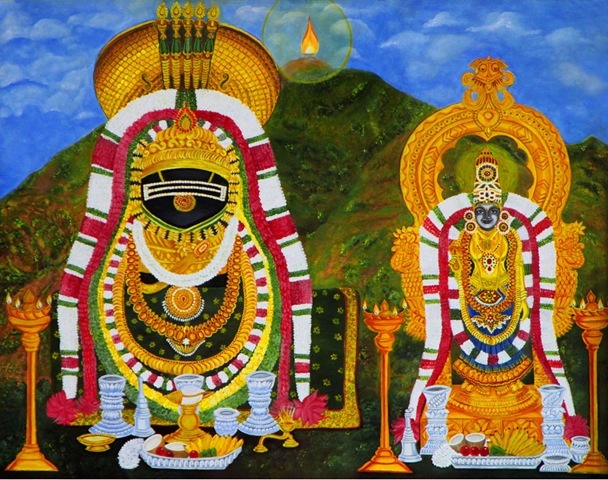 Lord Sri Arunachaleswara and Goddess Apithakuchambal, painted by Anandhi Muthukumarasamy. 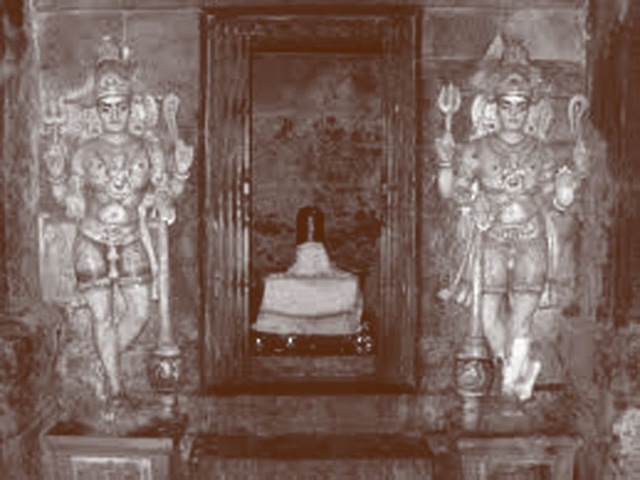 These dieties are enshrined in the Sri Arunachaleswara Temple in Tiruvannamalai. 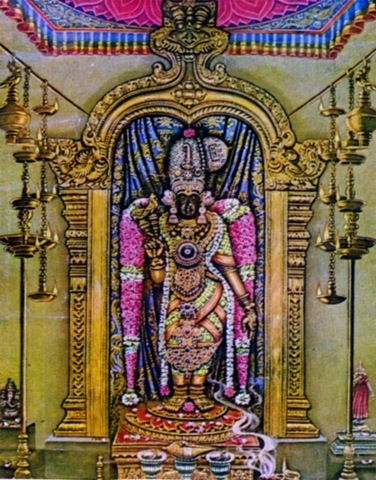 The painting is located at the SAT Temple. The following is an excerpt of Ramana’s recounting of his Self-Realization as it appears in the book “Self-Realization, Life and Teachings of Sri Ramana Maharshi,” by B.V. Narasimha Swami, published by Sri Ramanasramam. Sixrty-Three Saints within the Meenakshi Temple. 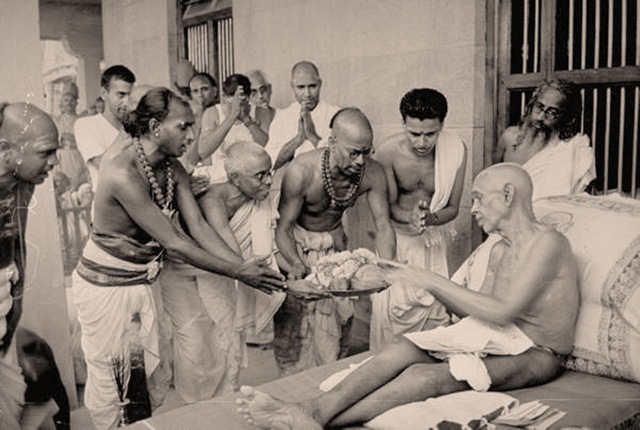 Visiting the temple regularly for worship and offering one’s service in its care is known to those whose life is drenched in Sri Ramana’s lineage of the Sanantana Dharma (Eternal Truth) and Advaita Vedanta (Nonduality). 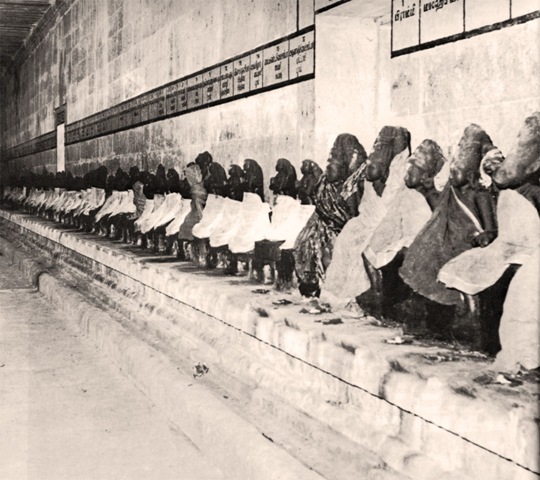 For eons, the wise have built temples, worshipped and meditated in temples, realized in temples, and cared for temples, viewing them as foundational to their spiritual life. Temples are a wondrous blessing for all humankind. 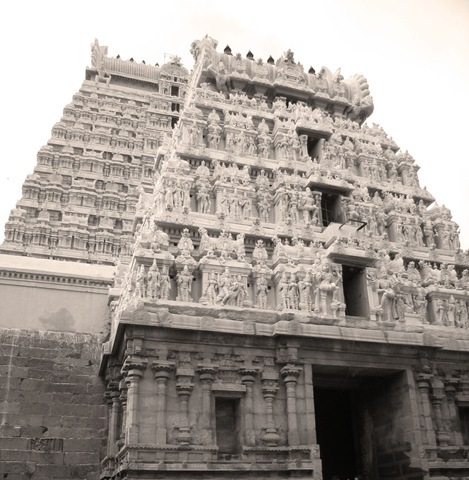 In Hinduism, temples vary greatly in their architecture, appearance, rituals, traditions and customs according to the presiding deities or Gods of each individual temple. 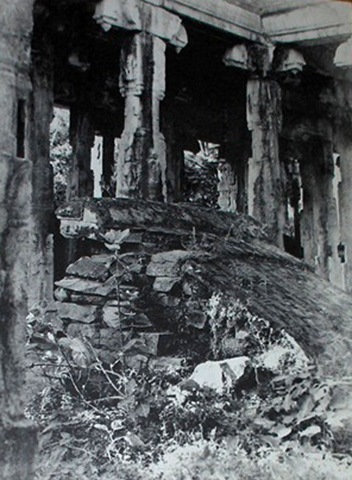 Traditional temple architecture is complex and by no means randomly designed. Many temples simultaneously mirror the outer cosmos—all manifestation–the inner cosmos—the mind space–and the Absolute, which transcends both. 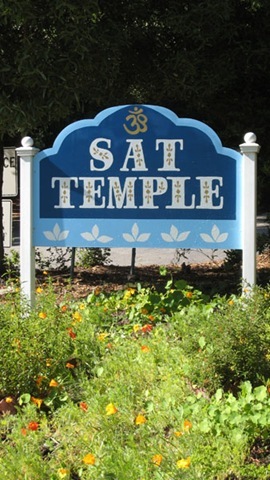 In other words, temple significance is no small thing as it represents the entire gamut of the cosmos and human experience pointing the way to Knowledge of the Supreme, which in Advaita Vedanta is understood to be Self-Knowledge. One could say that the Siva temple is born out of the mind of Siva, leaving a map, as it were, to oneself—Siva. Regardless of the school of thought or the deities or Gods each person worships, common among all practicing Hindus is the belief that visiting the temple plays a primary role in one’s spiritual practice. Depending on the approach of the spiritual seeker, it is a place of worship, prayer, and meditation. It is a place where one seeks solitude, solace, worldly and spiritual boons, blessings, and Self-Knowledge. The Satsang Hall inside the SAT Temple. Within the One like space. The One within like space. By A.R. Natarajan, Founder President, Ramana Maharshi Centre for Learning. The very word “servile” is obnoxious. To lose one’s dignity, to be reduced to mere doormats, is unthinkable. To serve human masters is bad enough. To obey the orders of their puerile and capricious mind is anathema. But we often do. Why? Forced, of course. Because fear of the consequences of disobeying looms large. You cannot disobey your boss without fear of losing your increment, promotion or even your job, if worse comes to the worst. So, you obey and carry your resentments, secreted in the inner recesses of your mind adding to the load of hurts you have been harboring. Often, our subordination in the hierarchical set up may be covered up, may be camouflaged, in so-called meetings, discussions and so on. For one is always aware as to who wears the pants, who decides. One is also aware that one’s own reservations about the wisdom of the decisions is of no consequence. Most people are clogs in the vast machine of industry, business and profession, servile not by choice, not voluntarily, but because that is the general set up in which one has to get along in life. You slog away night and day for a few crumbs in the form of salary, perquisites and bonuses. This makes one wonder if there can be a servitude which is to be opted for, which is most welcome. There is one such. One might be surprised at this assertion. For, servitude and joy are opposites, poles apart. Where is one’s much cherished love of freedom, which is being trampled mercilessly, albeit with a velvet hoof? Yet there it is. 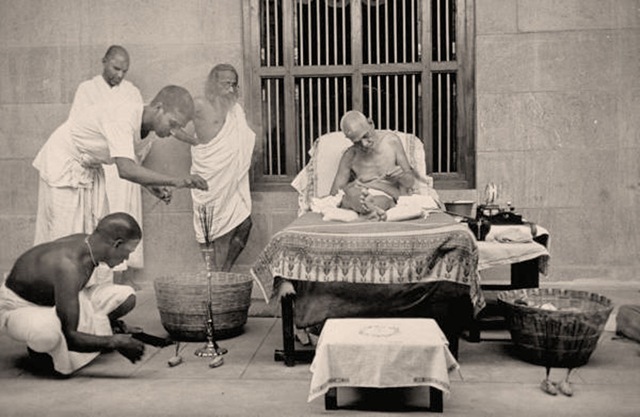 The enjoyable servitude: it is the servitude to Bhagavan Ramana. Oh, for the joy of it. What nectarine bliss it is. If one regards himself as Ramana’s servant, still there is the ego-based relationship; Ramana the master and “I” the servant. That is how one might begin, casting himself in that role. If the self-made casting is to be perfect, one should stand in attendance, looking out for an opportunity to satisfy every wish, let alone orders, of Ramana. Should he not? But, as soon as such an attempt is made, one is straightaway faced with the problem of dealing with a master who has no wishes, no desires, and one who is ever content. Ramana’s cup of happiness if full. His mind is dead. He is Bhagavan, the very embodiment of plentitude. So we are at a loose end, in a fix to find a way to serve him. 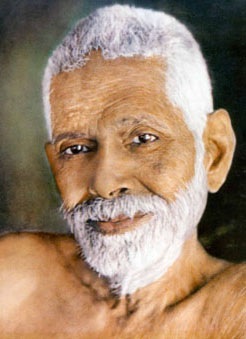 There is another difficulty, too, with this master Ramana. He goes on giving, bestowing his bounties in endless succession, including the priceless treasure of an inner life. Instead of our pleasing him with our service, he seems bent on pleasing us, in making us happy, in showering gifts asked and unasked. It is said that willing and unquestioning acceptance of the results of our action, of the realties of life, is an article of faith if one has surrendered, if one is wedded to implicit obedience to the guru. This of course is a must. But it does not go far enough. “Thy will be done” we say. That of course is the law. It seems necessary that one has to take the self-effacement even further and recognize that one is an absolute zero. The intelligence to act, the sustaining strength, and not only the results, are Sadguru’s gifts. Constant remembrance that he is the number one, which adds value to the zeros which follow, is needed. Blessed are the one’s who, generation upon generation, upon generation, selflessly serve the temple, keeping it alive for all humanity. at the SAT Temple in servitude to Ramana devotees. 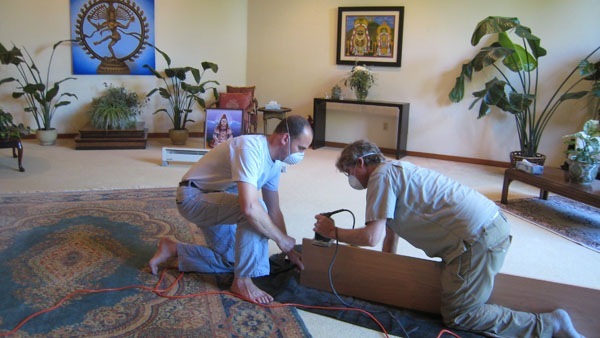 Nome and Jim prepare a wood piece to install in the Lotus room staircase. Installation is complete….now it’s time to stain and varnish. 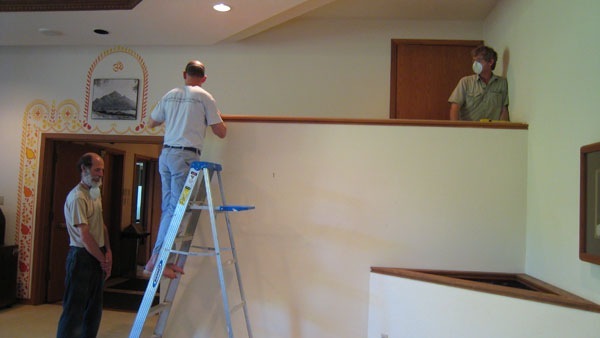 Bob stands near ready to assist as needed. 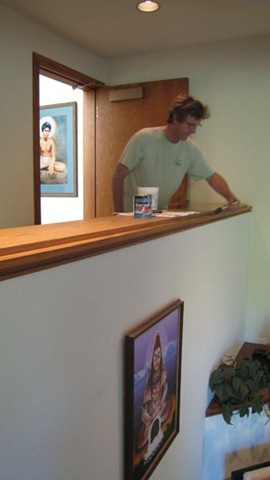 Jim carefully varnishes the wood. 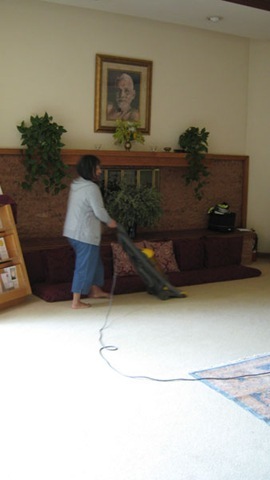 Myra vacuuming the Lotus room, preparing it for the next event. 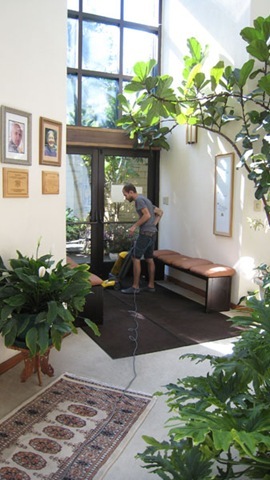 Here, Tristani, too, vacuums the entry to the Temple. With miles and miles of carpet it is a big job! 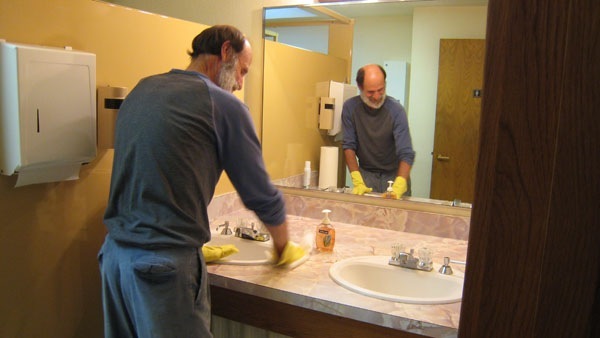 Bob is making sure the bathrooms are clean for everyone. 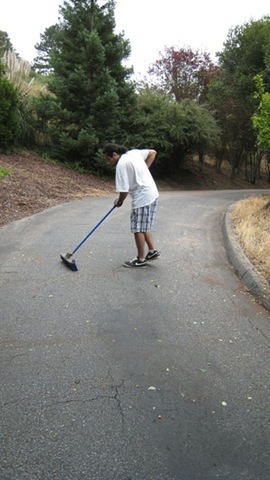 Here, Jaden sweeps the driveway that exits the SAT Temple. 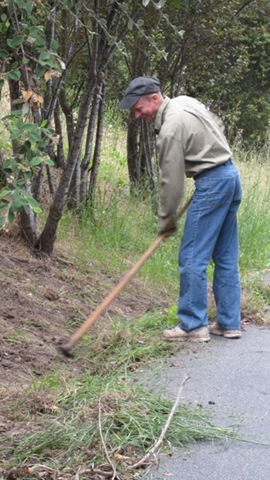 Ryan removes the weeds growing next to the driveway. 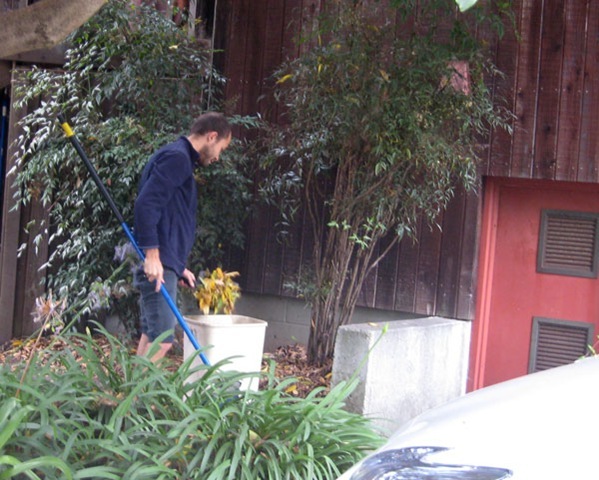 Tim also removes dry weeds near the Temple to reduce fire hazard. 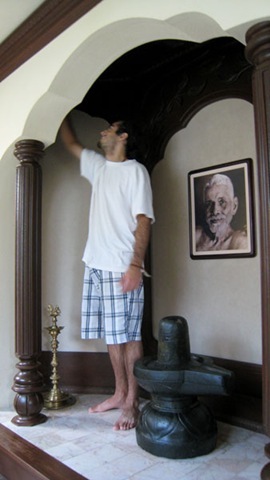 Here, Tristani sweeps the walkways around the Temple. 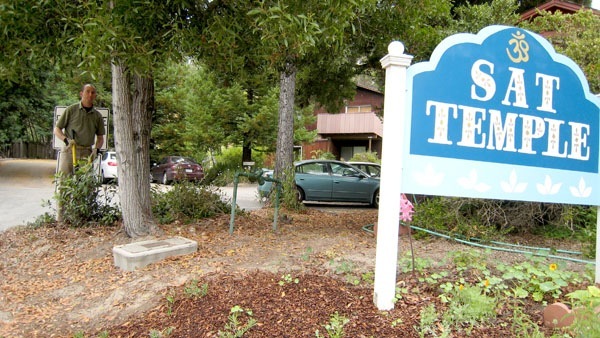 Nome trims the bushes near the SAT Temple sign. 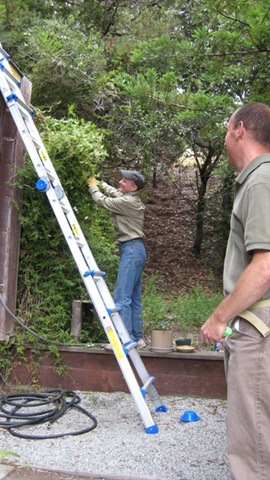 Ryan cuts back some jasmine that is growing too near the outside lights. 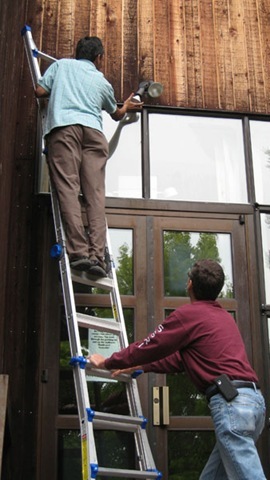 Raman changes the lights outside the Temple side entrance while Tim holds the ladder. 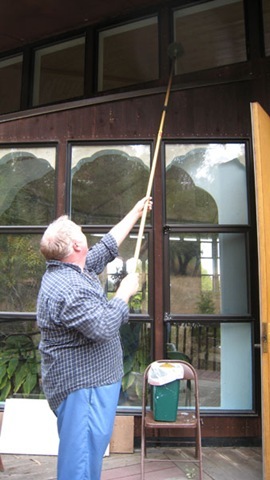 Here, Richard cleans the cobwebs from the Satsang Hall windows. Has anyone ever seen a cob? 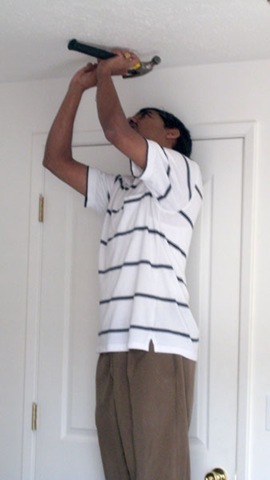 Raman installs a new smoke detector in one of the residential rooms. 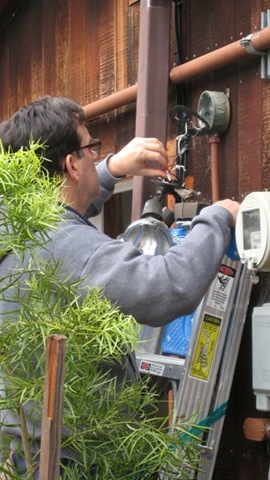 Here, Eric installs new outside lights on one of the residential houses. 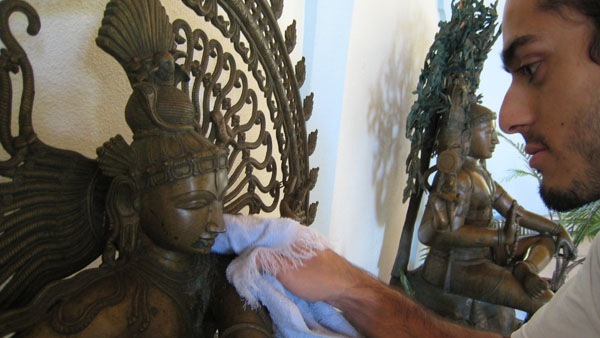 Jaden cleans Nataraja preparing Him for fresh flowers. 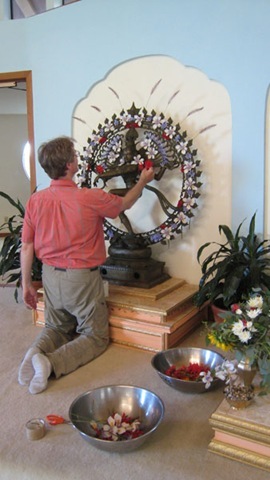 Jim prepares Nataraja for Satsang adorning Him with flowers. 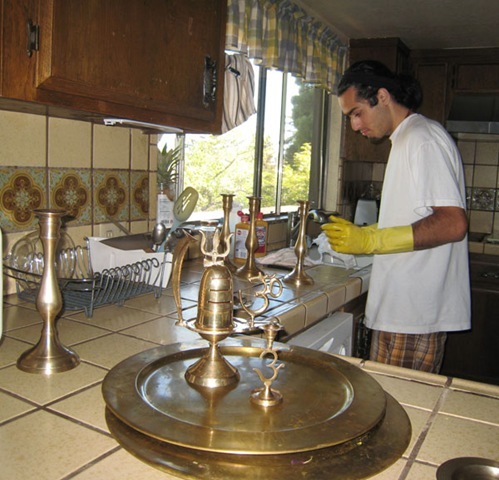 Jaden thoroughly cleans the shrine room, the inner sanctum, preparing it for fresh flowers while Ramana looks on. 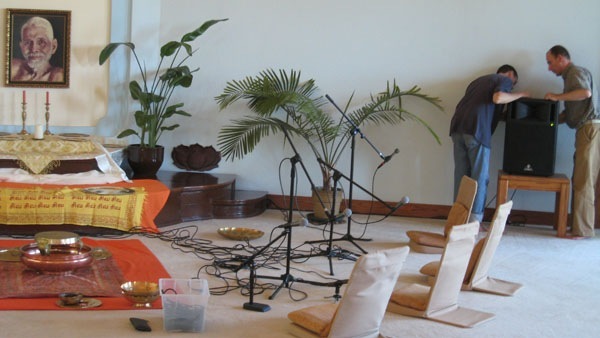 Here, Nome and Tim set up the sound system for Sri Ramana’s Self-Realization celebration. 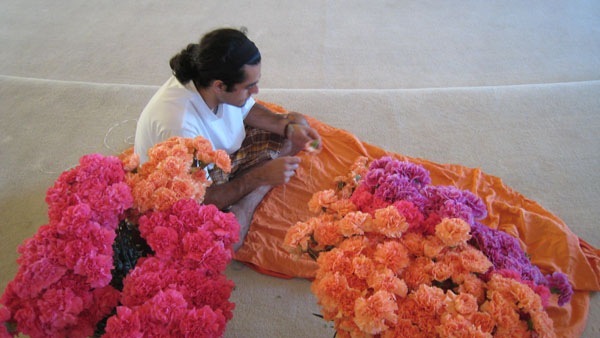 …and then makes malas for Ramana! 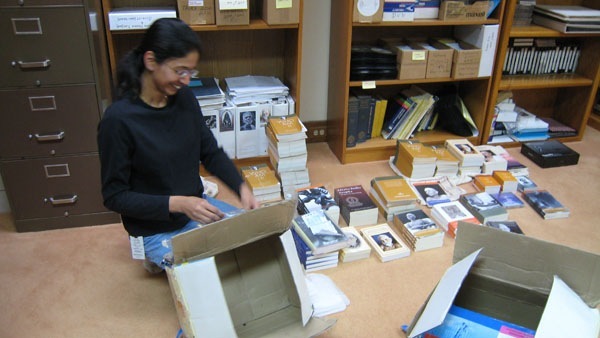 …while Sangeeta unpacks a book shipment from Sri Ramanasramam. 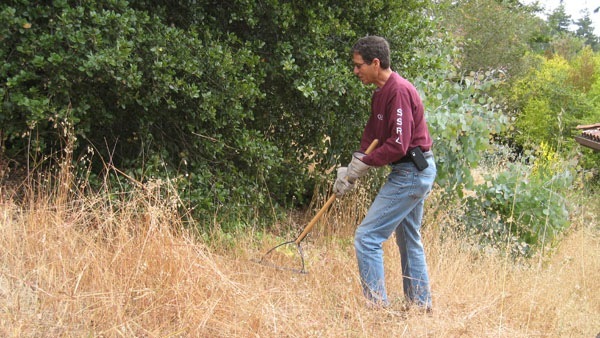 Here, Sasvati waters the Temple garden.